Handcrafted Shaving Mug ceramic scuttle set with a brush and natural, handmade artisan shave soap that is scented with Lime & Grapefruit Yuzu oils. A thoughtful unique gift for any wet shaver. Handmade wet shaving soap is scented with Lime and Grapefruit Yuzu oils which lets the aroma soothe and invigorate your senses. 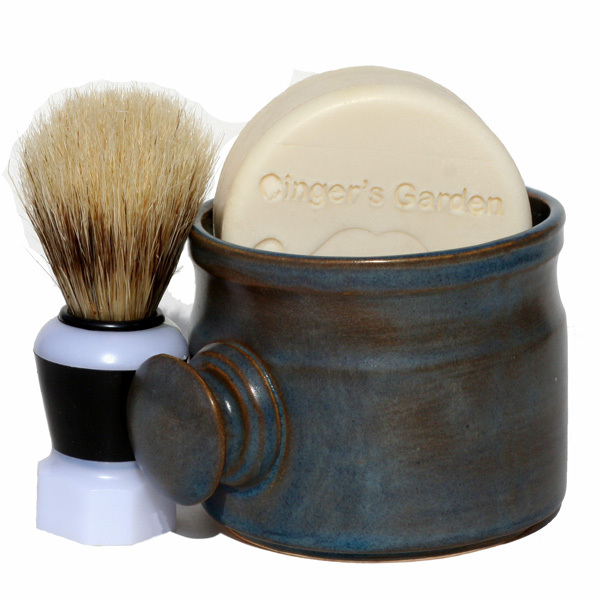 Each gift set includes a handmade, ceramic scuttle mug, round handcrafted shave soap and a shaving brush. Wet Shave natural handmade soap will give you lots of stable bubbles that last and help your razor to glide, for less nicks, razor burn or irritation. Lime Yuzu Grapefruit handcrafted wet shaving soap is round and hand cut to approximately 4 ozs. Makes a great gift for any man that's a wet shaver. This mug, brush and soap set makes a wonderful gift for a birthday or Father's Day. Buy this shaving soap for lots of stable creamy bubbles that are gentle on the skin. Each shaving mug is unique and handcrafted. As such, colors WILL vary. Please allow us to choose one for you. Our shaving brush now comes in its own box with a black handle. NOTE: GIFT SOAP SET WILL NOT FIT INTO A SMALL FLAT RATE BOX. PLEASE CHOOSE THE MEDIUM FLAT RATE BOX. Ingredients: Coconut Oil, Palm Oil, Safflower Oil, Kosher Glycerin, Purified Water, Sodium Hydroxide (saponifying agent), Sorbitol (moisturizer), Sorbitan oleate (emulsifier), Mango Butter (moisturizer), Soy bean protein (conditioner), Wheat Protein (conditioner), Bentonite Clay (for slip and glide), Lime oil, Grapefruit Yuzu oil, Titanium Dioxide.